With HD Metal Prints, it’s easy to inject your personality into any space. 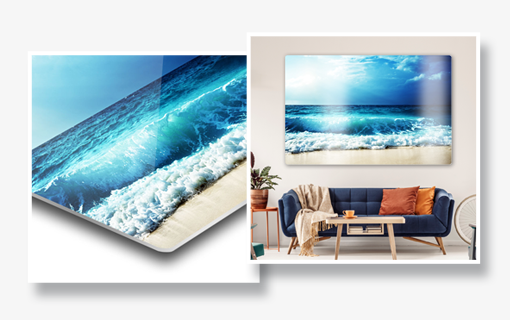 Created using high quality aluminium panels, our metal prints are tough, durable and weatherproof – perfect for any outdoor area under any weather conditions. How are our HD metal prints made? The process used to create a HD metal print is called dye sublimation. Artwork is first printed onto transfer paper. This is then attached to a coated HD metal sheet. Once this is done both are put onto a heat press, which allows the dyes on the transfer paper to heat into gas so that they can be pressed onto the surface of the HD metal sheet. Once completed and the metal begins to cool the dyes begin to return to their solid state. The end result is the infusion of your image and the HD metal print – creating something that is truly unique. Your images will take on a magical luminescence. What makes our HD Metal Prints the best? Durable: Our fully customisable, durable HD metal Prints provides you the opportunity to preserve your favourite photos for years to come. Fade Resistant: Your images professionally infused into the surface to ensure a quality look and feel. Varied Size Range: Available in wide range of sizes, the hardest decision you have to make it, where to hang them. Waterproof: Making them easy to clean. Colour won’t fade: 60 year no fade guarantee. Two priority factors that result in an excellent metal photo print are; the quality of metal photo panels and the expertise of the print service provider. The quality of the metal photo panels can differ greatly based on who you’re getting your prints from. At Canvas Factory we ensure quality by focusing on consistent base coatings along with high quality HD metal is used. Our print team have the expertise to get the best color out of the metal used. They have the ability reproduce colors accurately and are well versed in colour management throughout the length of the print process. Our print team also uses the highest quality inks that have been profiled specifically for metal panels.